So, I won’t include many spoilers and no big ones. I just want to talk about the book, my feelings, and the thoughts I had when the last pages flipped over and “the end” stared back at me. So, let’s talk about the characters. I was so happy to see so many faces back in this story! I loved seeing where they are, how they have changed and grown, and it made me so happy that wizards live so long. I still adore Professor McGonagall. I still smile when Hermione corrects someone. And I still laugh at Ron’s jokes. However, while so many faces were back, I also missed a lot of people. I wanted more about the other Weasleys, Hagrid, Teddy Lupin, and the other children, including James and Lily and Rose and Hugo. But, I understand this is a specific story, more about Harry’s family. So I can deal. Overall, I felt that the story was really sweet and also an interesting edition. I felt that it wasn’t a “necessary” addition, but who cares about that? It was still really great and action-packed. Reading about the characters, and just being in their world again, felt magical. Like coming home after a long journey (in this case, reality is the long journey 😉). 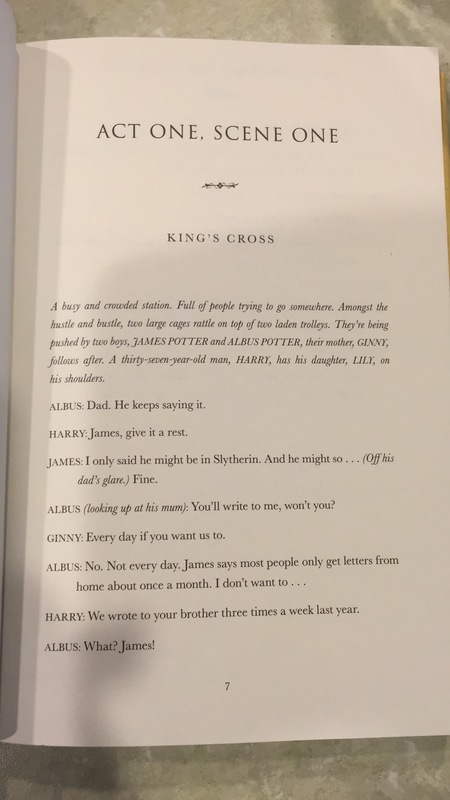 I am so grateful this story was released in book format so that all of us who can’t actually see the play get to read more about our Boy Who Lived. Although, I’ve heard rumors about the play coming to New York City Broadway next year. And if that happens, you can bet I’ll be booking a ticket so fast I’ll catch a golden snitch on the way to the airport. A little note about the format, also. It is not written like a normal book, because this is simply the original script for the play. If you’ve never read a script before, it might take some getting used to. There is significantly less detail because we are meant to watch the story unfold with all those details in front of our eyes. So, there isn’t much description of what the characters look like, how they are moving, what they are wearing, or what the scenery looks like. There are small bits about the expression the characters are wearing, to help the actor during that scene. The book is split into 4 acts, 2 acts in part one and 2 acts in part two. Each short “chapter” is a scene and you are told where that scene is taking place, and sometimes a brief description of what it looks like (for the stage designers). I’ve seen a few reviews where people say the format “ruined” the book for them. But I think it certainly doesn’t have to. It’s more about expectations. This doesn’t read like the HP we are used to, so just be prepared for that. 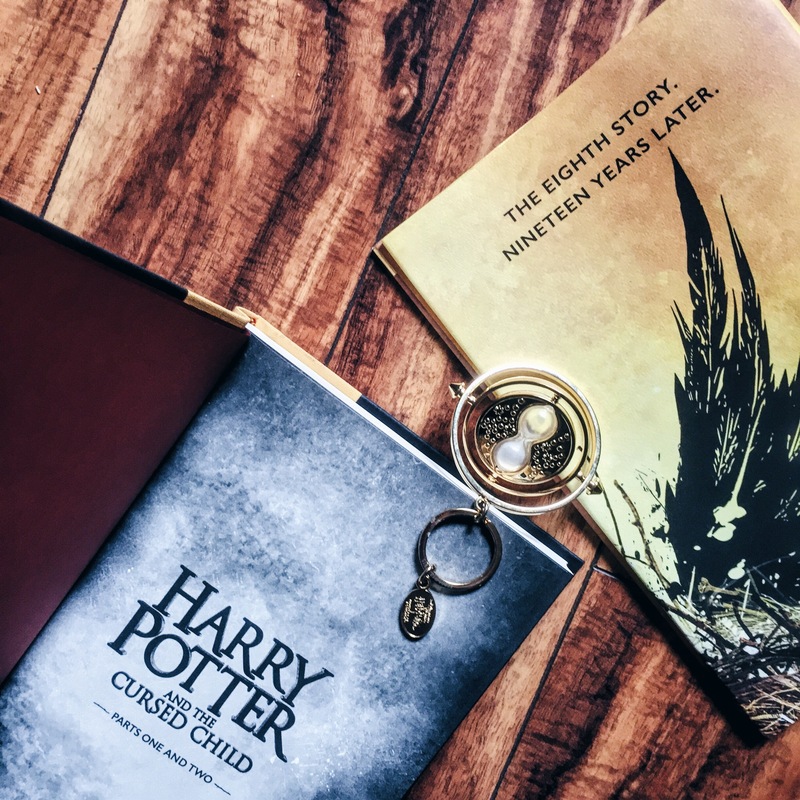 So, I guess my main conclusion here is that it was wonderful to be back inside Harry’s world. I loved every last page, and I may have shed a few tears. It was so lovely and also heartbreaking because JKR has said this is the official end of Harry’s story. She does not plan to write any more about him. So, savor this book and enjoy the ride. It’s a really bittersweet close to my forever fandom. If you’ve finished this book, please tell me what you thought of it! I’d love to gush with you. Oh my, God. Need need need. Ooh, maybe I can take a trip to London… 😉 Thank you for telling me that! I hope you’ll like it too!